Sister Sania, 38, servant of the Holy Sisters and director of Lé Senevé centre, caring for 80 children with disabilities (right). It is becoming increasingly worrisome that, in Syria, an entire generation of children are growing with little or no chance of fulfilling their potential; children who have become victims of the eight-year-long war, robbed of their childhood and even their right to education. In the words of Pope Francis, they have “spent most of their lives looking at rubble instead of schools”. Since the beginning of the Syrian war in 2011, the Syrian educational system has lost 150,000 of its professionals, including teachers. 1.7 million students are out of school and 5.82 million children and teenagers from pre-school to the secondary level are in urgent need of educational assistance. 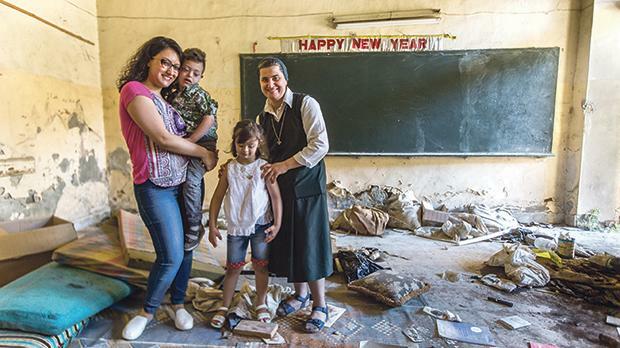 During Lent this year, Aid to the Church in Need (Malta) is organising a campaign for an education project for Syrian children which involves provision of scholarships, stationary, transportation, school supplies and operating costs. As part of this campaign, ACN Malta is calling on Maltese and Gozitans to make Lenten sacrifices and with the saved money, help in a voluntary manner, Syrian children in their education. ACN Malta is counting on the generosity of individuals of goodwill for the success of this campaign, which aims to provide Syria’s children with a better future. To donate, visit https://www.acnmalta.org/donate/, make a bank transfer to APS Account No. 20001771733 or send a cheque addressed to ACN Malta to: Aid to the Church in Need, 39b Mdina Road, ATD 9038 Attard, Malta. You can also call 2148 7818 for more information. This campaign is being supported by Fr Reuben Gauci, the coordinator of spiritual development in schools, Sr Alexandra Chircop of the Secretariat for Catholic Education, and Joe Farrugia, the Archbishop’s delegate for the laity.